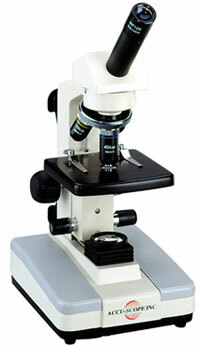 ACCU-SCOPE® monocular microscopes are designed to meet the basic requirements of routine work at an economical cost. They are sturdy, long lasting, and precision built with many advanced professional features. The highest quality coated optics give a precise image. The inclined eyetube, with its internal optical prism system, is fully rotatable, giving the maximum convenience in use. 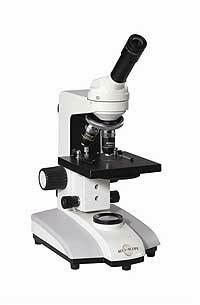 3088 Inclined monocular microscope designed to provide educators with a high performance, student-proof, instrument at an affordable price: widefield 10X eyepiece with pointer, locked-in, 18mm field of view; built-in 5 watt flourescent illumination. 3089 Inclined monocular microscopes for routine clinical and classroom work: widefield 10X eyepiece with pointer, locked-in, 18mm field of view; built-in 5W flourescent illumination; mechanical stage with low position controls. 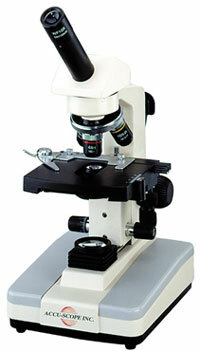 DSC Optical has access to a very wide range of microscopes and related products! If there is anything you need, please call our experts for advice or to help you make the right choice.